The thrills and spills of freestyle motocross create an extreme sport that is like nothing else. Flying through the air on the back of a powerful machine will get your adrenaline pumping and your heart pounding. There's something about living on the edge that makes you feel more alive. 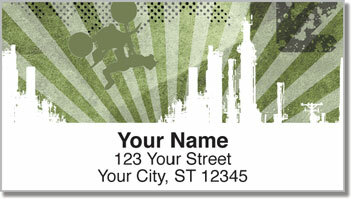 Stick something exciting on your normally dull letters and packages when you choose these original return address labels from CheckAdvantage. 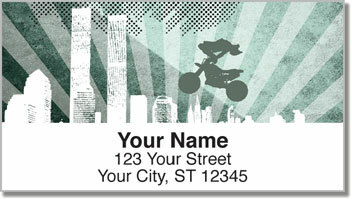 Silhouettes of motorcycles and riders soaring across city skylines creates an eye-popping design. 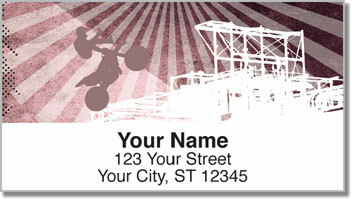 Plus, these labels are printed with a self-adhesive backing. All you have to do is peel and place to make a tiresome task quick and easy. 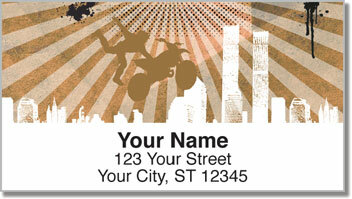 Order your own Extreme Motorcycle Address Labels right now! Get them with matching personal checks and free shipping today.